Better alternatives are always a good thing! For instance, why suffer with metal braces, when there is a better, easier alternative available to you? 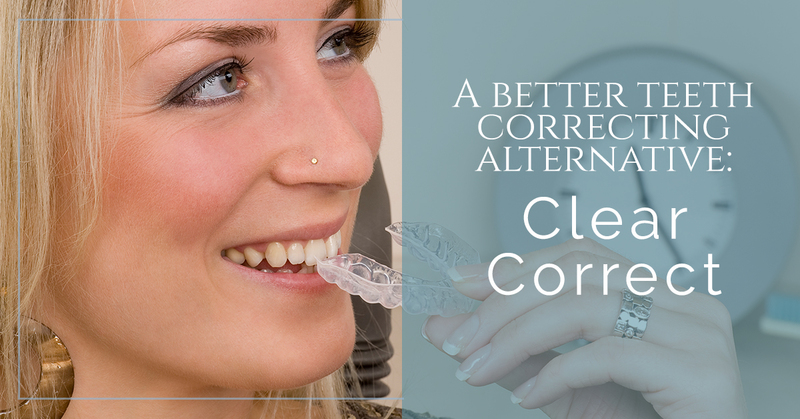 Clear Correct is a new method to get a straighter smile, without the struggle of metal braces. Braces can be an inconvenience because they not only require a lot of money to put on, but also time to put in place. It is known that when you have metal braces you have to get new wires every month, not to mention new rubber bands! Braces can be distracting and painful, especially when they are tightened at your dentist office visit. When they are tightened, you mouth can be sore and you can even develop headaches. Braces are also really difficult to clean. When you have braces, you must be careful of what you eat and when. For example, if you are out on a lunch date or an important interview, you often have to wait to eat. Braces are notorious for catching bits of food. Worst of all, they are hard to brush completely out. Your local dentist will often give you a small brush to clean in between your wires. The only problem, it is not always completely effective and can still leave behind a residue of food. If you are self conscious about your teeth and the contents with them, odds are, you won’t make a great impression. Because of this, you miss out on opportunities or go hungry because you don’t want your mouth to be full of food. Technology has come a long way, which is a huge relief to those who have less than straight teeth. It used to be that if you were born with crooked teeth you either lived with it, or if you could afford it, get metal braces. The world of dentistry has come a long way, as now there are many different options for teeth correcting. These alternatives range in material and, of course, price. Clear Correct is a better alternative to traditional braces because they are nearly invisible and are comfortable to wear. Unlike metal braces, Clear Correct doesn’t have any wires or any brackets. You won’t have to concern yourself with how much you will ache the day after a dentist visit any more! Clear Correct is a very simple procedure. All you have to do is in come into your local dentist’s office and get a series of radiographs and impressions taken. From there, a 3D model of your teeth imprint is sent to a lab by your dentist. At the lab, molding technology is implemented to see what your personalized Clear Correct liner should look like. More importantly, a team of professionals look to see what outcome they would like to see once you have worn your Clear Correct liners. Once it is established what gradual changes need to occur, your molds are constructed and sent back to your dentist’s office. Dentists, such as Andrew Curry D.D.S are equipped with Clear Correct Technology. If you are interested in receiving this new method of teeth correcting, contact our office!